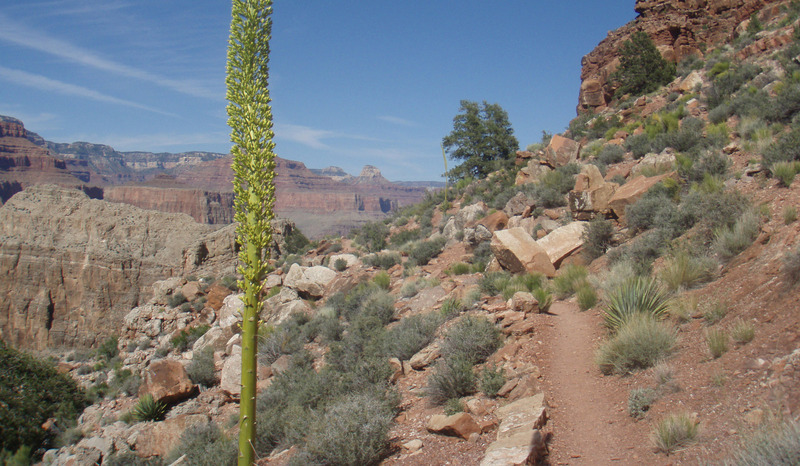 At one point in time, this trail was considered the best in Grand Canyon National Park. Some sections of the trail are still paved with stones that were laid by the Santa Fe Railroad 100 years ago. Hike to camp on day one and this will be your home for 2 nights – giving a full day to relax or explore some side canyons – on and off trail. 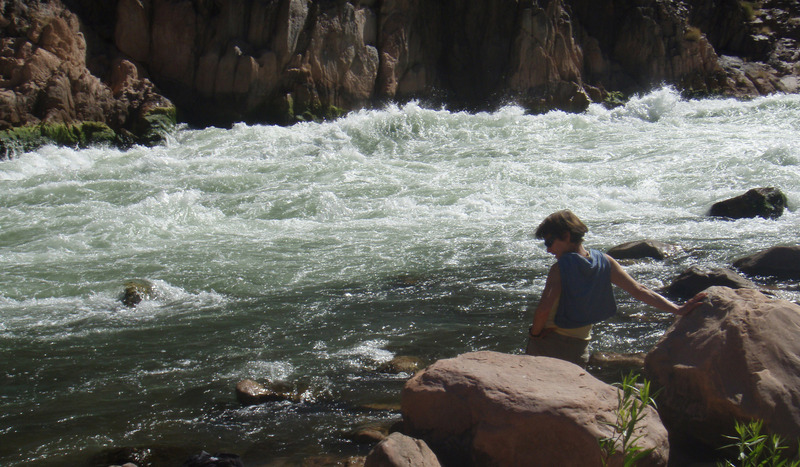 On the Grand Canyon Hermit Trail backpacking trip, you have a chance to see two of the largest rapids on the Colorado River (and be part of the Mile Deep Club), as well as an opportunity to explore parts of Grand Canyon’s history – the old Santa Fe Railroad camp. 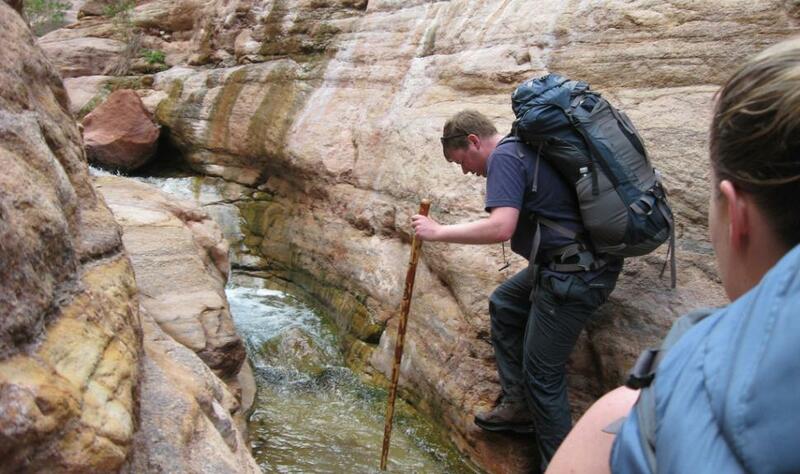 There are numerous options for a backpacking trip in the Hermit area – an out and back along the Hermit trail, make a loop and connect with the Bright Angel or South Kaibab Trails via the Tonto Trail or make the trip a great challenge and hike the Boucher Trail. 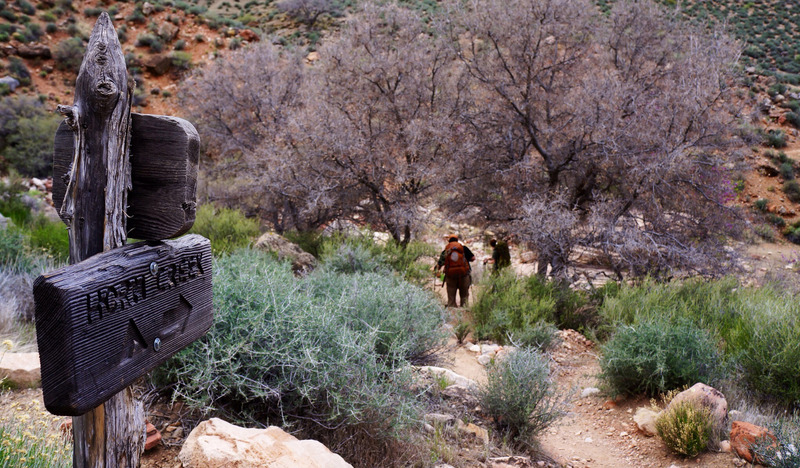 The Hermit Trail is one of the few trails that are not on the main corridor that is accessible most months of the year. February and March can see ice and snow on the trails but because it is a westward facing trail, ice and snow will melt faster. 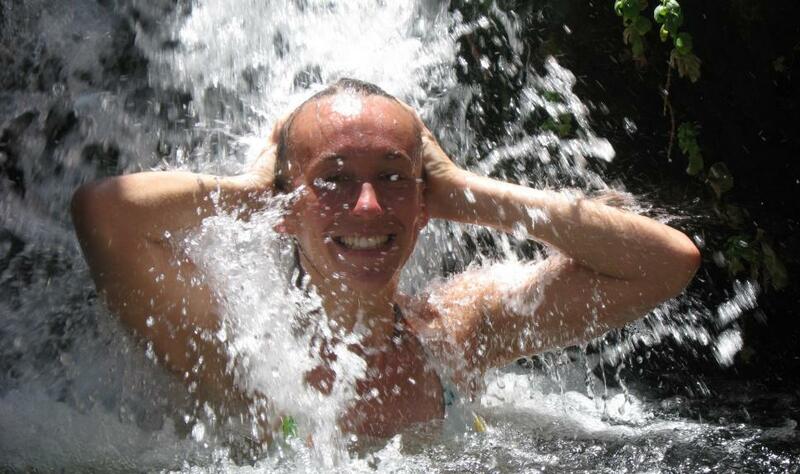 There is also water at the campsites so the area is still feasible as the temperatures climb. However, it is not recommended to hike the Hermit area June through early September due to extreme temperatures at the bottom of the canyon. But this is what our outfitting services for your Grand Canyon backpacking trip will provide you – great advice with decades of knowledge hiking Grand Canyon. Click here for more information about JRI’s outfitting services. If getting away from people (tourists), this is the hike for you. But with lack of people, also means lack on amenities. You will need to be prepared for more rugged trails and true backcountry camping.Need more information about the trail? 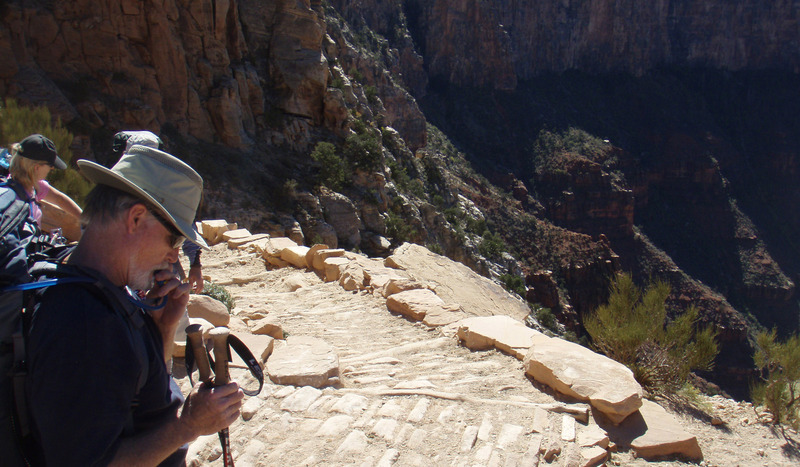 Click here for the official Hermit Trail description from Grand Canyon National Park. *Please note: Due to the high demand and limited supply of permits available for the Grand Canyon camping areas, we recommend having flexibility in your dates and open to alternate camp areas. We also recommend planning this hike at least five months in advance. You will need to get to the South Rim or Grand Canyon (Grand Canyon Village). Once you reach the canyon, you will hike Hermit Trail approximately 8.2 miles (13.2 km) to the campground at Hermit Creek, which is 3,740 feet (1,140 m) below the rim. The average hike time is 6 hours..
Today you move camp up river to camp along the Colorado River on the beach at Granite Rapids. The route takes us to Monument Canyon and past the 168-foot sandstone monolith called the Monument, which gives this canyon its name. While camping at the beach you usually see a river trip or two floating down the river, which is really fun to watch. The hike this day is 5.1 miles (8.2 km) with only about 600 feet (183 m) of elevation change. This is the day you will cover the most miles but the terrain is over rolling hills. You will cover 9.8 miles (15.8 km) of magnificent views of the inner canyon as you hike the Tonto Trail from Granite Rapids to Horn Creek. This is your last day of quiet before heading back to the busier trails. If time permits, the group will head to Plateau Point to experience some of the best views of the inner canyon. Hike back out to the rim by first hiking the Tonto Trail from Horn Creek to the junction of the Bright Angel Trail at Indian Garden. From here, we have a 3,000-foot (914 m) gain in elevation over the 7.0 miles (11.3 km) before reaching the South Rim.